After posting a little blog on Dudeism, the most relaxed religion I could find out there, I had a chance to correspond with Oliver Benjamin, aka “The Dudely Lama.” He lives mostly in Chang Mai, Thailand. First, he delicately pointed out that Dudeism is really based on a 1998 film written and directed by Ethan and Joel Coen called The Big Lebowski. The film had a powerful cast including Jeff Bridges, John Goodman and Julianne Moore, among others. Shocking to many, there are 260+ mentions of the popular expletive that begins with the letter “f” in the film. It probably wasn’t the language that kept me away from the film, because profanity usually doesn’t offend me. When the film came out in 1998, I was an executive in Manhattan with a nice corner office on Fifth Avenue, and also very pregnant at the time. Yeesh: just had a flashback of running around to meetings in high heels with a basketball for a belly, making my way through the east coast elements with a clumsy style and flair you kind of needed to see to believe. That’s about all I can remember of 1998 — that career juggling act, with my husband working in London, then giving birth… and then after that, it remains a complete blur. So, I don’t really have a good excuse for being so oblivious to the silver screen cornerstone of what became a funny, modern day movement with a huge following. Apparently I missed a good film and I managed to seem like a complete idiot to the founder of Dudeism. What can I say? He was a dude about it. And I get a film to look forward to. I love Jeff Bridges and the Coen brothers films, since O Brother Where Art Thou in 2000 was one of my favorites. Incredibly smart guys. Progress Planet: How many dudes are there in 2012? 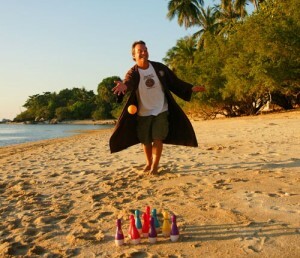 Oliver Benjamin: We have ordained over 150,000 Dudeist Priests all over the world. PP: Does Dudeism have a theme song? If not, what would it be? OB: We like Dylan and Creedence, but we’re pretty open to all types of music. The Eagles are not held in terribly high esteem for some reason. PP: In your CNN interview, you let on you might be starting a dating or mingle service for Dudes to meet Dudes. Just curious, have Dudes actually met and married by now? Like, are there second generation little Dudes in 2012? OB: Many Dudeists are indeed raising their kids in the Dudeist tradition. We don’t have any exact data though. Dudeists tend to be a bit disorganized. PP: Other than being able to officiate weddings in the US, what other formal recognition as a religion have you received? OB: We’re also not very formal. Consequently, we haven’t gone out looking for much recognition. Probably the most recognition we’ve received has been in the press. PP: What stands in the way of peace? PP: Why do you live in Chang Mai? You seem so totally SoCal. OB: I’m from Sherman Oaks (of “Valley Girl” fame), which is a suburb of Los Angeles. But I prefer living in Thailand. It’s much more relaxed. PP: Is there a future documentary about Dudeism? OB: Yes, last year an Anglo/Italian film company started work on “The Way of the Dude” (thewayofthedude.com). We traveled to Louisville to cover Lebowskifest and also to the UK. We plan to get back to work on it soon. PP: Why do bad things happen? OB: Because life is a complicated case. Lotta ins and outs, lotta what have yous. The best thing we can do is adopt a dudely attitude towards it. Life is the ultimate free lunch, but that doesn’t mean it’s always delicious. PP: What happens to people after this life? OB: Dudeists aren’t concerned with questions like that. They distract us from the enjoyment of this life. In fact, it’s possible that the whole idea of an afterlife was hatched to keep people docile and content to suffer. PP: Are there like guardian Dudes? OB: Yes. We are all guardians of each other. If you mean something with wings that keeps us safe, perhaps yes, but it’s probably from our subconscious or maybe from the occasional acid flashback. PP: What do typical Dudes like to eat? OB: We have the fewest dietary laws of any religion. But surely one hasn’t lived until they’ve tried an In-N-Out burger. PP: Dudeism is spoofy on the outside with some kind of solid core. How would you describe that? What chord did you strike with Dudeism? OB: I think that there are a lot of people out there who are religious at heart but can’t stomach the ideas that most major religions proffer. It’s not surprising, given that they’re 2000 years old or so. Except for literature, there’s nothing that we currently rely upon in our culture that’s so incredibly ancient. Of course, many scholars say that we need to look at religion in the way we look at literature, not in the way we look at science. And if that’s the case, why not have some new editions or totally new volumes? Dudeism is based largely on Taoism but it’s also very modern and playful. It’s the religion for its time and place. All the musty parts have been swept and painted. And we have this great movie which serves as the perfect vehicle: “The Big Lebowski.” It’s the deepest movie ever made, even if it contains 260 f-bombs and the protagonist smokes pot and drinks white Russians throughout the film. 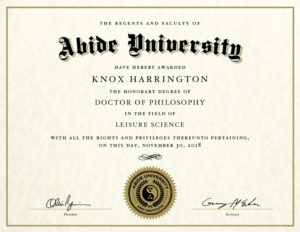 There have been several collections of scholarly dissertations on the film in the last few years and we’re looking to open up an online Dudeist university soon. You’re not dealing with morons here. PP: Are you considered a spiritual leader? OB: Not really. I’m more of a janitor or a librarian or maybe at best a magazine editor. I act as steward for a collection of ideas that Dudeists feel to be valid. And I’m always open to criticism. I’m not trying to scam anyone here. At some point, I’ll hand the job over to someone else. This religion of relaxation is really turning out to be a lot of work!